In an emergency, always call 9-1-1. For non-emergency information, call (941) 917-8555. For non-emergency information, call (941) 257-2800. If you or someone you know is experiencing emergency warning signs (see below), call 911 immediately. Do not try to drive to the ER. Life-saving interventions often take place in an ambulance, as does transmission of vital information to hospitals preparing for your emergency treatment. Our Emergency Care Center physicians are all board-certified in emergency medicine and have at least 10 years of experience, and our affiliation with John's Hopkins All Children's Hospitals ensures around-the-clock pediatric care by Sarasota Memorial and All Children's highly specialized Pediatric Hospitalists. Our Emergency Care team is backed by the full resources of Sarasota Memorial and ER nurses with advanced certifications in trauma and emergency care. Sarasota Memorial is the only hospital in the region – and among a select group across the nation – to earn the nation’s highest honor for nursing care – Magnet Nursing Services Recognition. 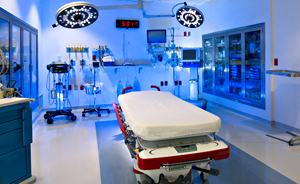 As Sarasota County's only trauma center, Sarasota Memorial's team of highly specialized trauma surgeons, emergency physicians, subspecialists, trauma and intensive care nurses and rehabilitation specialists stand ready 24/7 to deliver immediate life-saving care to people who suffer the most severe accidents and injuries in or near Sarasota County. Obstetrical Emergencies: Sarasota Memorial is the only hospital in the region with a 24-hour emergency department dedicated to pregnant women. Our OB ECC, Triage & OB Hospitalist Service is located next to the main Emergency Care Center on the first floor of the hospital. Our OB Hospitalists are available immediately throughout the day and night to examine patients, evaluate the progress of labor, check lab results, handle emergencies and provide a safe delivery for women who do not have their own physician or whose physician requests assistance. For urgent, but not life threatening conditions, you can also visit one of Sarasota Memorial's Urgent Care Centers in Sarasota, Bradenton and Venice. The clinics are open 8am-8pm seven days a week. In a medical emergency, always call 911. For tips on when to seek emergency care versus urgent care, check out our "Know When To Go" blog, or watch our "Urgent Care: Fast Facts" video series on our YouTube channel.